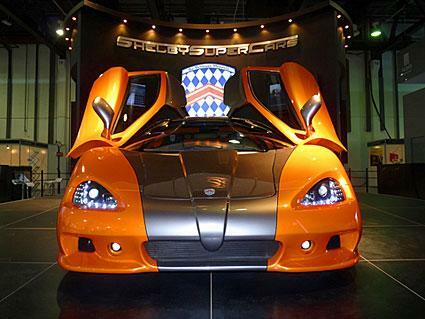 The 2009 SSC Ultimate Aero is the fastest car in the world. It is also the most powerful car in the world. With over 1,200 horsepower and speeds of over 270 miles per hour, this car is at the top of the official list for fast cars in 2009. Shelby SuperCars is a limited production company and has already gotten the fastest production car record in 2007 with the SSC Ultimate Aero TT. The TT model had an average top speed of 255 miles per hour. The new Aero has an average top speed of 270 miles per hour and 15 percent more horsepower then the TT model. Manufactured by Shelby SuperCars, the Ultimate Aero conforms to all emissions and safety regulations, just as any other production vehicle would. These regulations must be met by all cars on the list for them to be considered more than a model or prototype, which aren't considered for the title of world's fastest car. As recorded by Guinness World Records, the Ultimate Aero is the "world's fastest production car" and the "world's most powerful production car." There is not another car in the world that can top the speed or horsepower numbers of the Aero, though some do get close. Guinness World Records recorded an astonishing 270 miles per hour as an average top speed when the Ultimate Aero was tested on an uneven highway in the state of Washington. The zero to sixty times for the Aero is 2.7 seconds. The fastest car in the world is built with a one-piece billet aluminum engine block. The one-piece block helps boost the car's engine output from 1,183 horsepower to 1,287 horsepower. The aluminum block is also more durable than most others are with this high output of horsepower. It also shows better oiling capabilities and structural integrity. The SSC Ultimate Aero is a rear wheel drive, two-door coupe. The only available transmission is a six-speed manual. The engine is a Twin Turbo V8 with an output of 1,287 horsepower. The Ultimate Aero is built for speed, not pleasure driving, but you may find the interior quite comfortable. The center console includes an Azentek PC base Infotainment unit. This unit comes with the same capabilities of a PC and works with SSC's onboard diagnostic software. The console also has a digital temperature control unit and tire pressure monitor. Other interior features are full carbon fiber accents, gauge cluster, dash halves, doorsills and inset air vents. The steering column is equipped with an analog speedometer and tachometer with sequential shift light in the needle. The SSC Ultimate Aero includes a new braking system. The AeroBrake system is a rear spoiler that is controlled by a switch. The speed of the spoiler can be set, depending on the pressure applied to the brake pedal. Redesigned carbon fiber aerodynamics on the front of the car push 20 percent more air to the radiators, which results in quicker cooling. 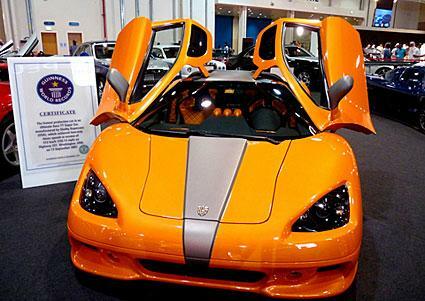 The SSC Ultimate Aero tops the list as the fastest car in the world, but other cars are close behind. These cars are not only fast but also very powerful and have quick zero-to-sixty acceleration times. If you're interested in fast cars and performance automobiles, don't forget to check out the following LoveToKnow Car articles below.